First thing Friday morning I was greeted by the lovely little Checkers. He's the sweetest little Chihuahua I've ever met. Friday was my day to explore downtown Ann Arbor. My friend Samantha had a few classes until the afternoon. Samantha talked about a few museums, sitting areas, shops, and restaurants I should go to during my Dora-the-explorer type of afternoon. We jumped on the bus after having a quick breakfast. There were two things about the Ann Arbor bus service that I liked. Number 1, the bus is GPS monitored. This gives the commuter the ability to track the bus location at all times. Number 2, the fare is only $1.50 while NYC is $2.25 and rising. Plus the bus accepts dollar bills!!! No need for tons of change. The ride was short from where Samantha lived so that was delightful. This trip to Michigan definitely made me realize that I walk a lot and I am always on public transportation. I need to get my drivers license already. Once I said my goodbye's to Samantha. I started my day by going along South State Street. My first stop was to the Michigan Museum of Art. I had a blast. It was refreshing to see different art. I've been to many of the museums in New York. I've seen the same exhibits over and over again. This was new territory and I was ready to see what Michigan had to offer. Here are my top four pieces of art from the University of Michigan Museum of Art. If you find yourself in Ann Arbor be sure to visit this museum. To view more photos from the museum you can view them on my Facebook page. After spending almost 2 hours in the museum, I realized that had a few more hours until Samantha got out of class. I originally planned to go to 2 more museums but I scratched that idea and decided to walk around. It was almost lunchtime and I am thankful for my Facebook friends because someone suggested that I go to Zingerman's for lunch and that a very good idea. More on that later. The weather was beautiful on this afternoon so the idea of walking around was the right choice. There were so may different restaurants in one location it reminded me of certain areas of New York. It felt like a mix between downtown Brooklyn and some parts of Astoria, Queens (Steinway not Ditmars). After the museum, I went to a very large Starbucks and grabbed myself a state mug. When I was in Austin, Texas I picked up one of these Starbucks mugs because I just thought the image of a guy playing a guitar was cool but now I've started collecting these mugs and it's a good way to tell a story while drinking coffee/tea with friends and family. After Starbucks, I went into some of the trinket shops, took some of pics of Ann Arbor graffiti. I wanted to catch a movie at this gorgeous theater but there wasn't enough time. I loved one particular shop that sold Hindu brass statues. They were all so beautiful but very pricey. That Friday was the day the iPhone 5 was released. On Facebook and Twitter I kept reading about how bad the lines at the Apple store were. It was the total opposite in Ann Arbor. There were about 2-3 people in the tiny downtown AT&T store. I looked inside and chuckled to myself. I stopped into a record shop with the friendliest staff. I was looking for someone old school reggae albums but all I could find were more recent compilation records. After my search I started getting hungry and made my way to the famous Zingerman's Deli. This was a bit of a walk from where the university was and from the local shops but it was worth it. The first rule of Zingerman's is: you can try anything (edible) in the entire deli. That blew my mind. I didn't know of this rule until I was already full but if I had known sooner I would have tried some of the cheeses and truffles. Zingerman's is known for it's sandwiches and if I find myself back in Ann Arbor I will be taking a trip here for lunch. This was also a great chance for me to charge my phone. I'd been taking pics non-stop during the day. I got a very basic salami sandwich. I should have taken a pic once I dressed it all up. Before leaving Zingerman's I grabbed a small cup of the paw-paw custard. Paw-paw is a fruit that is native to Michigan, it's in the custard apple family. It was very yummy and creamy. After lunch I started to head back to the University. I did stop in a few shops and looked around. My last stop was to the Ben & Jerry shop to finally try the Greek Frozen Yogurt. I met up with Samantha right in time, we hopped on the bus and headed to her home. Later that night, Samantha and some friends introduced me to a Cuban restaurant downtown Ann Arbor named Frita Batidos. This restaurant had picnic style seating and the food was amazing for being considered "Cuban inspired street food". I ordered a Negra Modelo beer and the fish frita (a white fish burger served with shoestring fries on top in a soft egg bun). The atmosphere was young and lively. 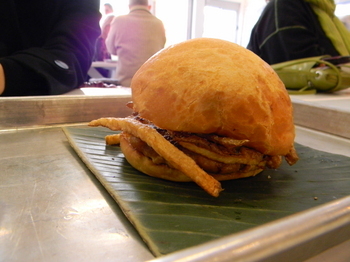 If you find yourself in Ann Arbor, you HAVE TO go to Frita Batidos. After our bellies were full we went to Samantha's friend Sandra's home to hang out, get out of the rain and kick our feet up. Friday was eventful and I enjoyed every second! More entries of my Michigan trip to come.